Patriotic Quilts: Happy 4th of July! Today is Independence Day in the U.S. so QM is celebrating with patriotic quilts both new and old. We’ll start off with Old Glory from the brand-new July/August issue of Quiltmaker. Old Glory was designed and made by Margie Ullery of Ribbon Candy Quilts. We chose this quilt as the Scrap Squad project for this issue. It lends itself to many different color recipes and you can sprinkle just about anything across the bars of color. The names of Union generals are stitched into the stars of the patriotic quilt above, made by Mary Rockhold Teter of Noblesville, Indiana, for her son George, who served in the Civil War. In 1920 George Teter presented the quilt to his grandson’s wife, Martha Brown Teter, in honor of her own military service during World War I. The family donated the quilt to the Smithsonian in 1940. Great Seal of the United States. Early 19th century. This eagle quilt is from the Smithsonian’s National Museum of American History/Kenneth E. Behring Center. It features the Great Seal of the United States in applique from the early 19th century. It’s credited to the Brown-Francis family, Canterbury, Connecticut. Red, white & blue Prince’s Feather Quilt, 1870’s/1880’s. This 1870′s/1880′s red, white and blue prince’s feather quilt is hand appliqued and hand quilted in the classic four-block configuration. It measures 76″ x 78″ and was sold on ebay about a year ago for $900. Eagle quilt from the International Quilt Study Center and Museum, 1870–1890. This stunner is from the International Quilt Study Center and Museum in Lincoln, Nebraska. Dated 1870–1890, its maker is unknown but it possibly originated in Cherry Tree County, Pennsylvania. If you’ve never taken time to browse their massive collection of quilts and the online catalog, please do so. It’s inspiring. Patriotic pictorial quilt made between 1860 and 1880, probably in the United States. Here’s another beauty (above) from IQSCM. It’s listed as probably made in the U.S. between 1860 and 1880. July 4th Gathering is one of the free quilt patterns in McCall’s Quilting’s free ebook. Our sister publication McCall’s Quilting has a free ebook on Patriotic Quilts. It features three patterns for patriotic quilts you’ll love. One of the free patterns is for Nautically Nice by Laurie Simpson. Do check out the free ebook. This fabulous quilt (above) was based on an Irene Berry pattern in the May 2007 Quilters Newsletter. The quilt was paper pieced, and each 6 inch block (196 in the quilt) has 24 seams. We spotted it on quiltinspiration.blogspot.com. I hope you’ll take a peek. 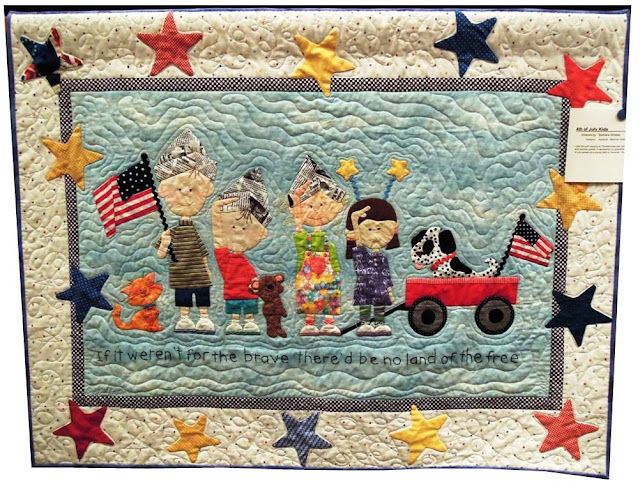 This website has lots of cool stuff including the adorable quilt above: 4th of July Kids by Barbara Shates. As you can see, patriotic quilts come in all shapes and sizes. Maybe you’ll start one today! Have a safe and happy Fourth of July!